Pretty much halfway between last year’s successful premiere of ICE USA (Intl. Converting Exhibition) and the next edition, I took part in a Steering Committee meeting on Tuesday for the 2013 show, along with nine other industry-advisory members. (Check out our team photo below). 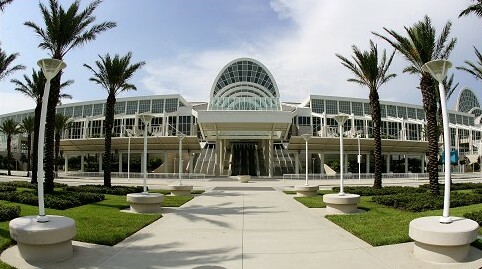 Set for April 9-11, 2013, ICE USA will again be held at the Orange County Convention Ctr. in Orlando, FL. 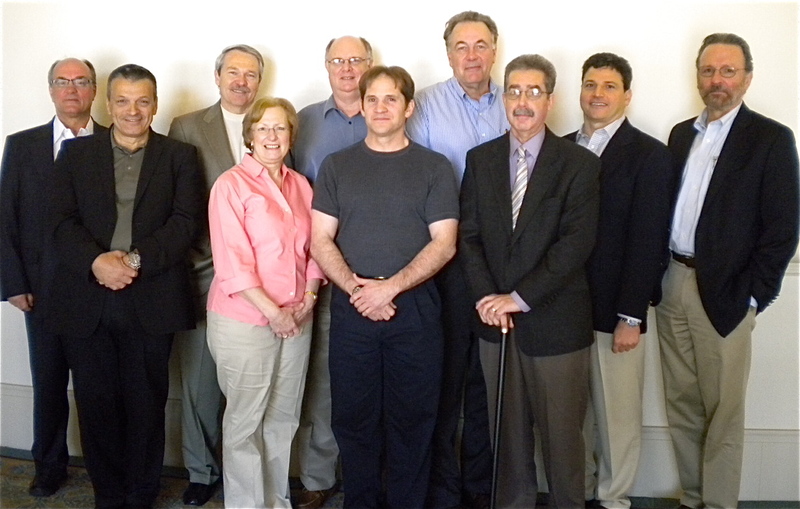 Back row (l-r): AIMCAL executive director Craig Sheppard; Roger Halligan of H&A Intl. ; ICE USA show director Bob Chiricosta; Bob Dages of CoSo LLC; Mike Pappas of Catbridge Machinery; and Ed Montalvo of The Montalvo Corp. Front row (l-r): Kurt Oegerli of Max Daetwyler; Yolanda Simonsis of PFFC Online; Bob Pasquale of New Era Converting Machinery; and yours truly. The event will follow closely on the heels of ICE Europe on March 19-21, 2013, in Munich, Germany. Show organizer Mack Brooks Exhibitions isn’t worried about that arrangement, saying that while many of the exhibitors are similar to ICE USA, the visitor audiences are, of course, geographically different. One year before ICE USA 2013, the same number of sq ft of display space has been reserved. In 2011, there were 252 booths, and so far for 2013, there are 205 booths taking up the same amount of space. Thirty-one companies have taken bigger booths, and there are 17 new first-time exhibitors signed up. All in all, show director Bob Chiricosta predicts 2013 will top out at 25-30% bigger than the premiere event. AIMCAL will again organize and present a comprehensive, two-day technical conference as well as its CEMA Fundamentals seminars on slitting/rewinding and coating/laminating. Along with the TAPPI-sponsored conference, there may also be courses offered by RadTech and the Pressure-Sensitive Tape Council. Pavilion-wise, the AIMCAL group of 24 member companies will return, and there may be pavilions set up by TAPPI or for the folding-carton segment of the industry. A new 20×40-ft Technology Showcase Theatre will allow exhibitors to make 15-min commercial presentations right on the show floor. They will run noon to 4 p.m. each show day so as not to conflict with the educational conferences in the mornings. Visitor attendance is free; exhibitor cost is $399 per time slot. The highly popular “Ask The Experts” setup returns with industry consultants answering attendees’ questions on coating, laminating, film extrusion, slitting and flexographic printing. Visitors can reserve specific appointment times online. And speaking of flexo, a demonstration center highlighting the print method (as well as diecutting and embossing) is planned. Committee members pointed out that ICE USA would be the only East Coast-located flexo show next year as the FTA INFO*FLEX will be run in San Diego in 2013. All-inclusive booth packages will make exhibitors happy by providing all elements needed at greatly reduced prices. Silver, gold and platinum 10×10 setups range from only $225 to $1,775 for everything from carpet and furniture to lighting, cabinets, literature racks and 4c custom-printed wall panels. In other good news for exhibitors, drayage rates for machinery are down 20% from 2011, and a second machinery crate pays no drayage at all. And in good news for everyone, the ICE USA Golf Tournament makes a comeback on Monday, April 8, 2013–the day before the show opens. The four-person scramble format will be run on the award-winning Rosen Shingle Creek Golf Club course. I know that 12 months is a long time to plan ahead, but I know where I’ll be next April 9-11. Join me and the thousands of converting professionals who should be in Orlando for ICE USA 2013. This entry was posted in coating/laminating, digital printing, flexible packaging, labels, package printing, paper/paperboard/cartons, printed electronics, slitting/rewinding and tagged converting, corrugated, flexible packaging, flexography, gravure, ICE USA, labels, packaging, paper, paperboard packaging, plastic film, printing, tape. Bookmark the permalink.